This section of the site contains a selection of images taken from Tom Riding's personal family album. A youthful Tom Riding in 1955 pictured in the yard at Longridge reversing Leyland Beaver four wheeler Reg No EBA 151 on to its draw-bar trailer. This was a Saturday afternoon when he was on a 36 hour pass out of R A F Weeton. Pictured here in 1968 is four year old Pamela Riding daughter of the late James Riding. 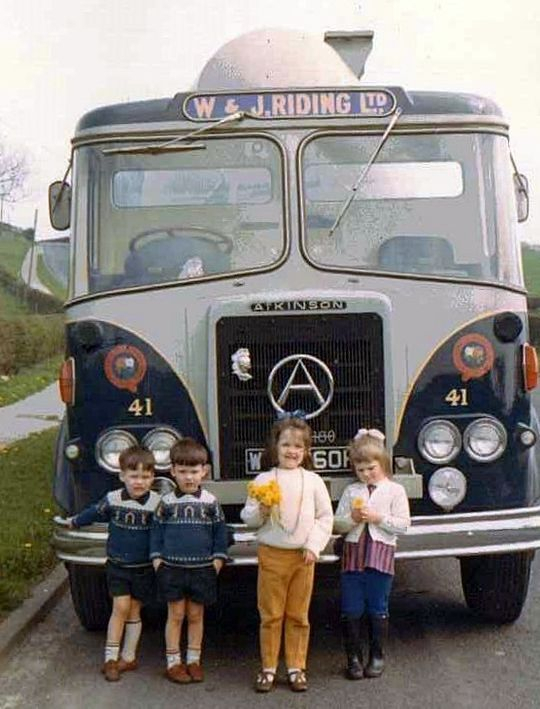 She is pictured standing in front of Atkinson Mk I Silver Knight 4x2 tractor unit Reg No BTB 420E Fleet No 57 while on the right is the last tilt cabbed Ergomatic Leyland Beaver that entered service with the company in 1967, Reg No YTD 360D Fleet No 58. Tom Riding recalls below a great way to spend a Sunday morning. 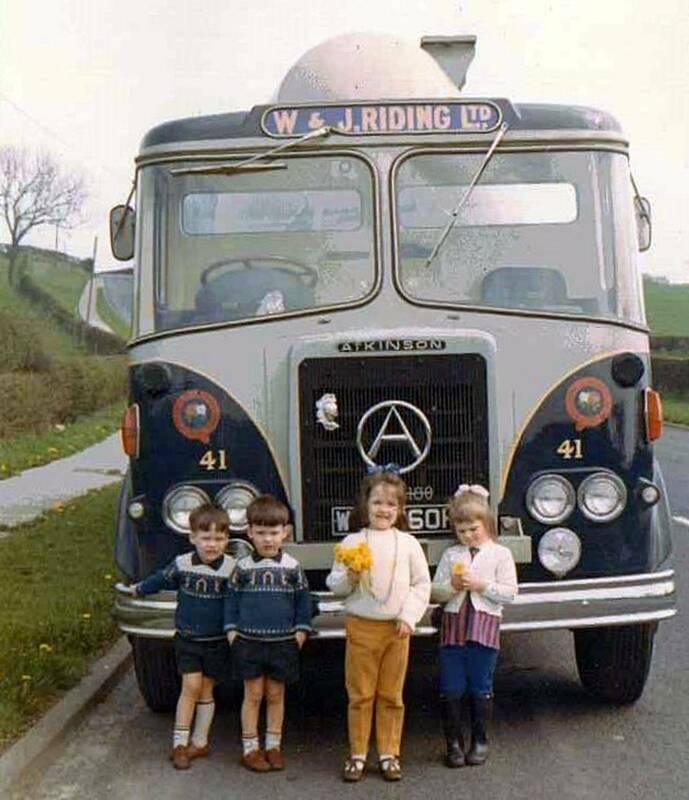 "In April 1970 i jumped in this outfit to take the children for a ride and also take a few photos along the journey. This particular photograph was taken on Dale Brow, a couple of miles from the depot at Longridge. My late brother's twin boys Matthew, Jeremy and daughter Pamela are on the left while my eldest daughter Elizabeth is on the right, what lucky children!". 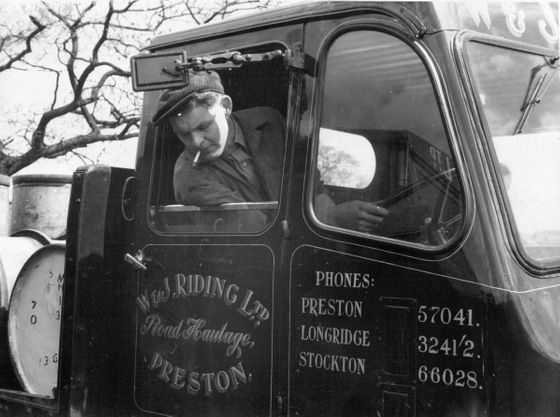 The Atkinson Mk II 4X2 tractor unit pictured is Reg No WTB 660H Fleet No 41 which was a brand new addition to the Riding fleet on the 1st of March 1970 at a cost of £4,708.22p. Tom Riding's younger sister the late Irene Riding is pictured here in the depot at Longridge alongside her Triumph GT 6 Mark II Reg No TTE 740H. Powered by a 2 litre 6 cylinder petrol engine it was registered new on the 22nd of August 1969 at a cost of £1,269 17s 3p. Irene was a director and shareholder of the company but took no part in the day to day running of the business as at that time she was in fact to become the headmistress of a prestigious girls school in the South of England. As well as having a love of fast cars Irene also held a private pilots licence. Scammell Rigid 8 at the Tyne-Tees rally in 1985 which was the year it was finally restored.
" We had a trouble free run to South Shields but on arrival i discovered the Metallastic rubber coupling behind the gearbox was close to collapsing so i decided to leave it in the yard of Crows Transport in Gateshead. I sent a new coupling up to our Teesside depot and they fitted it and the following weekend my brother James and I went back up for it. In any organisation you must have some good men and we were blessed in having more than our fair share. In the picture above, from left to right, are myself standing next Jim Blezzard who worked with us for nearly 40 years and was fleet engineer from 1971 to when he retired in 1996. 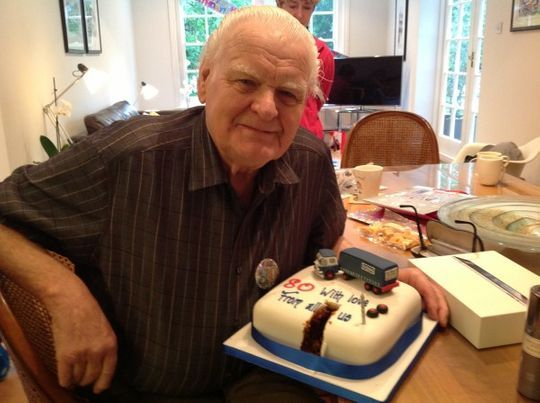 Jim was a craftsman and could make or mend anything. 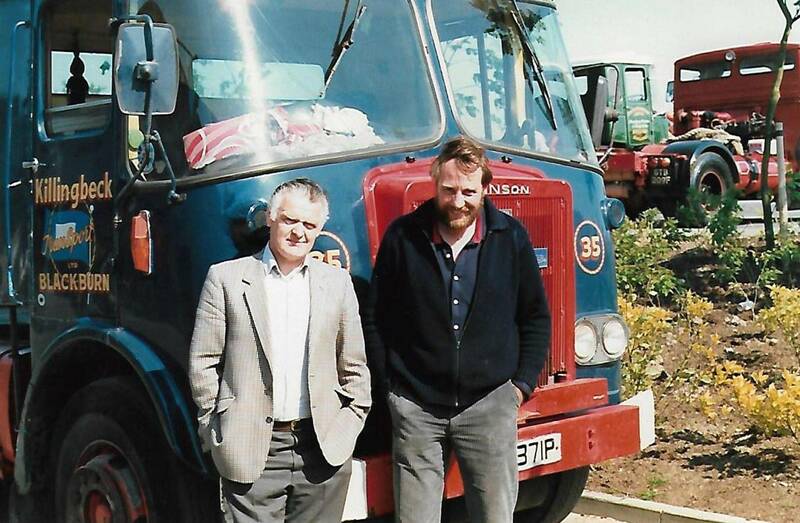 On the right is my late brother James who worked all his life with the company and was an excellent Traffic Manager and his way of doing the traffic sheets was used right to the very end". 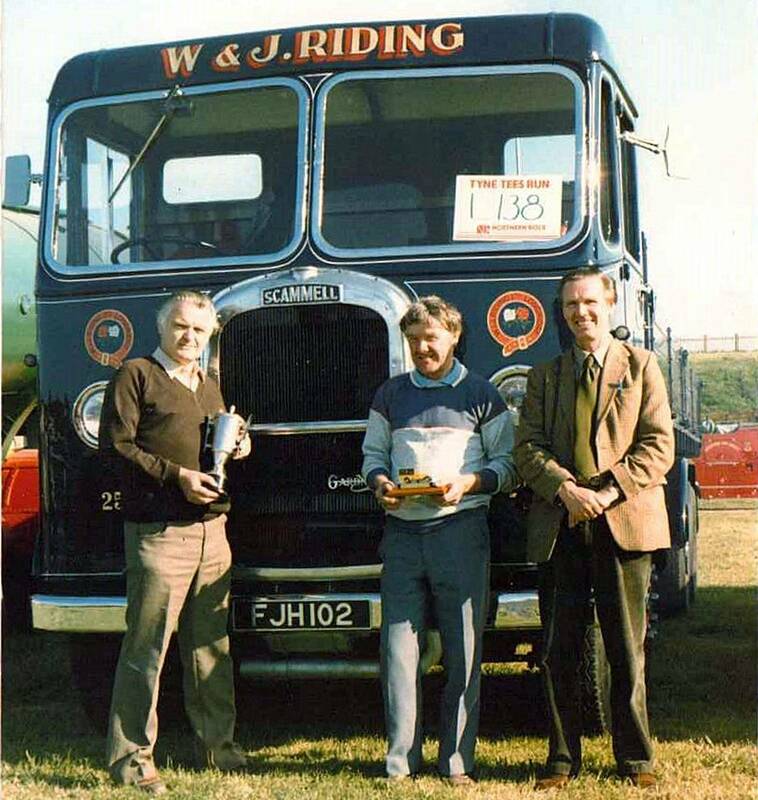 Tom Riding takes time out for a photograph with his close friend 'Doctor' John Killingbeck during an Atkinson gathering at Leyland on the 22nd of May 1988. They are standing in front of John Killingbecks Atkinson Venturer Reg No KBU 371P.